[...] not only will Scientology no longer spread, it has stopped spreading about four years ago. By my observation — and I've observed quite a number of other missions, my own, and orgs. — it's shrinking rapidly. And I think that if the idea of financial scrutiny is viable — and I think it would also be allowed by law, corporate law — that the funds are handled as prescribed by law for non-profit corporations — were that done, all they could do over there is service people. And that would actually help? It would help the people. It would help the people, but the little neo-Nazi types wouldn't have anything to do. Do you have any other witnesses? What I'd like to do at this point, quickly — this is very vital to Mr. McKee's testimony and to everything else in this case. If we could put on the — I mentioned at the outset in my opening the decree in the case of the United States v. Article or Device. The case, as I said, came down in 1971, and judgment was entered in 1972. At that time, after the Scientologists had lost two jury trials with regard to, basically, all the issues we've talked about here — the medical issues — the court required — if we could go down to number three. No. That's the wrong one. That' s the wrong one. — "than eleven-point type — than eleven-point, leaded type." Just bring it down — the other way. I've just read from number three: "Any and all items of written." And then there's the warning, which is supposed to be in eleven-point leaded type on the cover page or on the title page: "The device known as the Hubbard Electrometer or E-Meter used in auditing, a process of Scientology and Dianetics, is not medically or scientifically useful for the diagnosis, treatment, or prevention of any disease. It is not medically or scientifically capable of improving the health or bodily functions of anyone." That's what the court ordered in 1972. And within the last forty-eight hours, we have purchased a couple of publications from the Fort Harrison Hotel, which have already been introduced in evidence, and one of them is the book, Dianetics. And nowhere in that book does that warning appear. There is a little — "To the reader," which you can barely read, which discusses Dianetics as some type of a religious philosophy. And, also, the book, All About Radiation, by a Nuclear Physicist and a Medical Doctor — also, the warning is not affixed in that publication. So, I will put the judgment into evidence. Would you say they are in violation of the court orders? Within the State of Florida, the city, or the county, who should be made aware of that information, what agency? Mayor, it could range from the Secretary of State, dealing with the Charitable Corporations Division, the State's Attorney General, the Pinellas County State's Attorney General, the Pinellas County Consumer Protection Department, and if there was a Consumer Protection Department in the City of Clearwater, they could enforce it, also. And the next exhibit is an exhibit, entitled "Scientology Operations in Clearwater," which is several hundred pages of Guardian's Office activities against your former mayor, Mayor Cazares, including Operation Tacoless, Operation Speedy Gonzales, Operation Keeler I, Operation Keeler II — some of these things you've probably read about in the newspaper — as well as Project Normandy, the first page of which states: "Project Information. The major purpose of this project is to obtain enough data on the Clearwater area to be able to determine what groups and individuals B 1 will need to penetrate and handle in order to establish area control." And then Operating Targets are just about every major organization in the City of Clearwater. And the other — the last exhibit is simply — or the next to the last exhibit is a collection of documents involving, basically, how to commit criminal operations. And then we will be entering into evidence, approximately, ten to twelve affidavits of various individuals that corroborate the testimony, and in some degree add to in some degree of some of what you heard, including the Affidavit of Tonja Burden, who was a Sea Org. member at the age of thirteen to the age of seventeen; she spent two and-a-half years in Clearwater. During this time she received no education, as the affidavit states. She worked sixteen to eighteen hours a day, between the ages of fifteen and seventeen, coding and decoding telexes for some of those operations and other criminal operations going on in the United States. Those codes were double- and triple-coded in the Owl Code, the Eagle Code, and codes of similar type. So, she was coding and decoding, and she didn't even know what she was coding. And she also — she ended up in the RPF, and she describes conditions in the RPF, some of which you've heard here today. She describes an individual chained to the boiler in the Fort Harrison Hotel; she describes conditions on the ship; and she generally describes what the Guardian's Office did to her when she escaped from the Fort Harrison, went back to Las Vegas, was kidnapped, taken to California, told to pick up the cans, the E-Meter, and was subjected to an intensive security check, during which period of time she signed legal releases to L. Ron Hubbard, Mary Sue Hubbard, the Church of Scientology, waivers, admitted that it was all her misconduct, and that she owed the Church of Scientology sixty-three thousand dollars. No. She's now about twenty-two years old. At that point, was she still a minor? 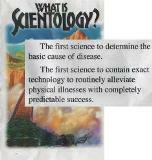 And the individuals that are now running the Church of Scientology were Sea Org. members of her age that grew up with her with L. Ron Hubbard, in the age of twenty-one, twenty-two years of age. And there are many other affidavits here that pertain to various subjects, including a widow, Peggy Baer, from whom in two weeks they got thirty-three thousand dollars shortly after her husband died — she was targeted — and similar types of items. We'll mark all of those affidavits. At this point in time, we'll wait to hear from Scientology. Well, ladies and gentlemen, we thank you for being with us for four days. We will be waiting for the Scientologists, as you will be, Monday. I wonder — as I said earlier, before these hearings started, that it's not the big city fighting this small organization. It's little old Clearwater that's trying to defend itself against a worldwide organization that's taking in over a million dollars a day in Clearwater. I, Karen E. Rizman, a certified court reporter and Notary Public, do hereby certify that the foregoing hearing transcript of the City of Clearwater Commission Hearings Re: The Church of Scientology, pages 4 through 420, is a true and accurate transcription of my dictated tape recordings of the proceedings taken at the Clearwater City Hall, Clearwater Florida, on Saturday, May 8, 1982.